Ashoka Gears expertise in Double Helical Gears manufacturing. These gears can bear high torque. Our double helical gears having similar advantage and smoothness like single helical gear. 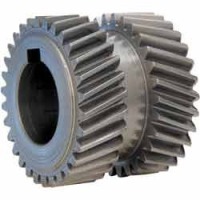 Double Helical gears are very useful in Marine industry and Heavy equipment manufacturing marine gears boxes, rolling mills, steel rolling mills and other heavy industries. Two gears of the same type are stacked together and make it one. Most double helical gears come in cylindrical form. It has two sections of teeth which are simply referred to as the left hand and the right hand. At Ashoka Group, we provide you with great gear options that other Helical Gears Manufacturers may not be able to give. Material : MS or Alloy Steel, Carbon Steel as per ASTM, BS, IS, AISI, SAE or any as per customer requirement. Module : Upto 60 Module.